Allow him to reintroduce himself; his name is Nolan ‘Mr. Buckets’ Smith. It was showtime in Cameron Indoor Stadium on Tuesday night, and Duke put on quite the performance in Smith’s return to the lineup on Tuesday. Nolan led all scorers with a career high 24 points, while Jon Scheyer added 20 points, no turnovers, and threw in an absolutely ridiculous rejection. Miles Plumlee also had career highs in points (15) and rebounds (11). Brian Zoubek joined the party as well, collecting a game-high 13 rebounds to go along with 9 points. The win booked the Blue Devils a trip to New York City for Thanksgiving, where they will face Arizona State in the semifinals of the NIT Season Tip-Off next Wednesday. Should they win, Duke would set up a potential final matchup with UConn. But let’s not get ahead of ourselves. After three games in the past week, we’ve learned a few things about this 2009-2010 Duke squad. The first is obviously the importance of Nolan Smith. After serving a two-game suspension for playing in an unsanctioned summer league, Smith’s effect on this team was remarkably visible on Tuesday night. Smith showcased a myriad of skills – the runner, the stroke beyond the arc, the midrange jumper, and most importantly, the ability to break down defenders and get to the rim. His presence allowed the Blue Devils to utilize the on-ball screen and roll with great success. But perhaps the most important element that Nolan brought to Cameron on Tuesday was an air of confidence. He’s certainly been outspoken about having been “in the lab” all summer, but he brought swagger and intensity to the team that hasn’t been seen at Duke in recent years. That intensity affected the entire team, especially on the defensive end. Duke forced 17 turnovers – an increase from each of the previous two games. By playing long and getting in the way of passing lanes (especially when playing zone), Nolan and Jon were able to push the tempo and get easy buckets to the big guys on numerous occasions. Which brings us to a third point. Against Charlotte, Duke’s big man rotation of Thomas, Zoubek, Kelly, and the elder Plumlee produced a whopping 30 points and 27 rebounds. 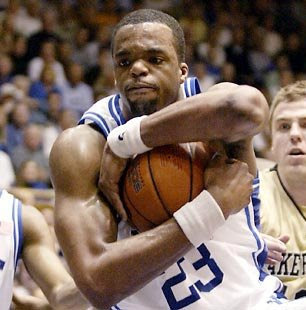 As mentioned before, Miles had a career night down low, and has emerged through three games as Duke’s most legitimate post threat since the days of the Landlord, Shelden Williams. For the first time in a long, long time, Duke will have a rebounding edge over most teams in the country. With Miles seemingly getting better and better by the game, we can only imagine what his talented younger brother will be able to do when he recovers from injury. While other Top 10 teams (cough cough) have struggled in their opening games, Duke’s solid performances in the early going should be an indication of this team’s potential. This is a very different team from years past, and there are quite a few question marks. We’re not sure how logging heavy minutes will affect Kyle, Nolan, or Jon come March. We’re not sure if our newfound depth in the frontcourt can match up with the best post players in the ACC. But there is one thing we can be sure of: with veteran leadership, talent, and depth, we’re in for one hell of a ride. Nolan calls himself Mr. Buckets on his twitter. He’s a man of many nicknames. And serious game. No doubt Duke has looked impressive against overmatched foes (something no other top teams can say at this point), I am interested to see how they play when they have the athletes to guard them and when the new defensive schemes are given a legitimate test. Raymond–thanks for that. Radford was a quality opponent, returning 4 starters and the pre-season Big South Player of the Year in Parakhouski. That team went to the NCAA’s last year. If anything, that big of a win wasn’t really expected. In a few months, we’ll hopefully have Mason Plumlee back, arguably our most talented big man. Hopefully we ride this success into the ACC season with an excellent record.